Whether and how strongly antimicrobial substances have an impact has been examined by the researchers in a screening. In this process, the bone substitute material is combined with various types of bacteria. Hospital germs can be fatal, since they are resistant to antibiotics. As a result, alternative methods of defense against bacteria are in demand. Fortunately, a German-French research team has been able to develop bone implants that keep the germs at bay. The figures are alarming: Hundreds of thousands of patients in German hospitals are infected annually with germs that are resistant to all common antibiotics. As a result, wounds remain open and inflammations spread, weakening the organism and sometimes even leading to death. Pharmaceutically, it’s hard to get a handle on the problem: The development of new antibiotics is expensive, time-consuming and tedious. When the drug is finally on the market, it’s not long until the germs mutate and form new resistance. Moreover, if surgeons use bone implants, it may happen that germs invade the body. Infections of the bones are especially problematic because they can be difficult to treat – antibiotics, which are transported by the blood throughout the body, only reach the implants in very low concentrations. “It would be best to avoid infection from the outset by providing the implants with an antimicrobial shield,” says Dr. Iris Trick, a microbiologist at the Fraunhofer Institute for Interfacial Engineering and Biotechnology IGB in Stuttgart. Along with materials scientists at the French CIRIMAT Carnot Institute in Toulouse, the Fraunhofer team has developed a bone substitute with integrated protection against infection. At first glance, the fine-grained implant looks like flour. Only under the microscope can one see what is inside: The individual grains of the granules consist of apatite crystals. These are similar in composition and structure to natural bone material, which is formed of the same chemical elements – calcium and phosphorus. The granules make it an ideal material for implants. To prevent complications, some manufacturers coat their bone substitute material with antibiotics. It’s not one hundred percent protection, of course, because resistant bacteria can still spread. The interdisciplinary research group took a different path. The aim was to use natural materials to reduce, suppress or kill bacteria on calcium phosphate crystals. In the project “Biocapabili” – short for “Biomimetic Calcium Phosphate Anti-bacterial Bone Implants for Local-infection Inhibition” – the international team has worked with various substances and compounds: with silver, copper and zinc ions, for example, but also with enzymes and peptides which kill bacteria. The French researchers have managed to incorporate metal ions into the apatite crystals. 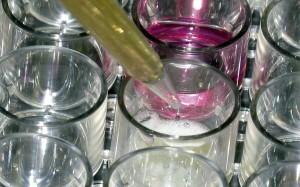 The biologists in Stuttgart have been able to provide evidence that the finished powder actually protects against infection: In the IGB laboratory, Iris Trick put the samples on microtiter plates in mutually insulated cups, infected them with bacteria, and then allowed the bacteria to grow for several days. Among them were several Staphylococcus species, which are among the most common hospital germs. The result: In the immediate vicinity of the apatite, the number of bacteria was reduced by more than 90 percent. A peptide coating has turned out to be equally effective: “With the help of peptides, apatite granules and pellets are protected against bacteria,” says Dr. Michaela Müller, who applies the coatings at the IGB. The hardness test in the microbiological testing has already been passed: The dangerous bacteria could not multiply on the surface of the pellets and granules. This means that antibacterial bone implants can be produced with the peptide coating. “However, antibacterial activity alone is not everything in medicine,” says Dr. Anke Burger-Kentischer, group manager of Molecular Cell Technology at the IGB. “Before a product can be used in practice, it has to be ensured that it does not harm the patient.” The researchers have already taken the first step. 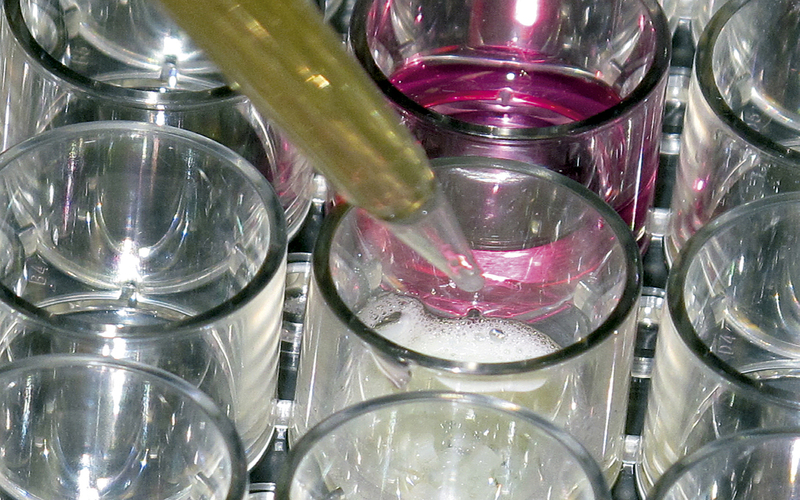 Human cell cultures have been added to the implant samples on microtiter plates. “Using these cytotoxicity assays, we have been able to determine how many metal ions, enzymes or peptides in the granules could be tolerated by the cells,” summarizes Burger-Kentischer. The clinical studies, which are the next step, will be conducted by the German-French research team in collaboration with the industry. Research News of the Frauenhofer-Gesellschaft, Jun 02, 2014.
apatite granules, bone substitute, metal ions, peptides, protection against infection. Bookmark.